Our Humane Educator shares compassion towards animals and lessons on animal behavior during interactive tours of AWS. 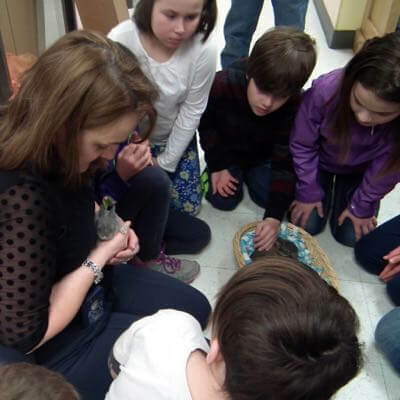 Students are encouraged to ask questions and engage their curiosity towards animals of all kinds. AWS welcomes school clubs, scout troops and other community groups to AWS for an interactive visit. Tours include visits with the animals, lively discussions, and a behind-the-scenes look at what goes into running our programs and services. Each tour is unique and customized for the individual needs of the group and its students. We can accommodate a variety of student needs. We take into account the emotional, educational, physical and sensory needs of the students in the group by using trauma informed education and special education training, as needed. Please schedule your group’s tour in advance by calling Brie Roche, Humane Educator at (207) 985-3244 x 109 or by sending an email. Tours are limited to groups of 8 or less and should include one adult per 4 children. Is your child a youth hero? Is he or she a true champion for animals? For children who go above and beyond by advocating for AWS pets through raising funds, making personal donations or organizing collection drives, we want to say thank you! We offer a private, personalized tour to these heroes to thank them for their kindness, generosity and selflessness. Each youth hero receives a personalized certificate and a photo opp with their favorite AWS pet. Please fill out our Youth Giving Form to schedule your child’s donation drop off and hero tour.